Jewelry Days.com Official Blog: How opals offer those opulent colors! How opals offer those opulent colors! Thank you for that enlightening and informative article! 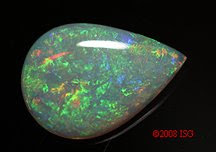 I have always been fascinated by the uniqueness of the opal and have loved the unique and colorful patterns that each one produces but I have never really bothered to think about where these gems get the beautiful array of colors they have. I guess I just happen to believe in the wonder of nature and never really bothered knowing the scientific explanation over most things. But it was surely interesting to know about diffraction grating and I might just take a closer look on gemology from this time on.